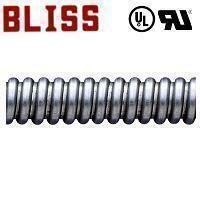 Bliss flexible conduit A2082 is UL listed, file no. 113601. High quality and good service are your best choice. Flexible steel conduits can be a wide scope of application, all lamps, communications, control, air conditions, electrical room, the fire alarm system, and so on. When we consider the working space, safety, construction facilities, vibration-proof, anti-interference, the integrity of wiring construction and pipeline construction, the use of flexible conduit can solve the problem of pipe construction. For more information, please see "Appendix". High flexibility. Reduced - wall flexible steel conduit. Meets national electrical code 350 and underwriters laboratories requirements, file #E113601. Meets Taiwan power company 1134.201-ES-7 (REV.2) spec. of electrical flexible conduit, file 77-099.